Van Buren Gentleman’s Salon owner Deanna Goldstein shares tips to consider for your next haircut. Men's hairstylist Deanna Goldstein says Ryan Gosling's haircut is a frequent request from clients. Naturally. Read below for her hairstyle tips for Chicago men. Man Up Chicago: What hairstyle, or hairstyles, do you think men should consider this winter? MUCh: From you experience styling men’s hair, what is the best single piece of advice you can give to any man when making a decision about how to style his hair? DG: Be realistic. Consider you hair texture, thickness and thinness and also your lifestyle and age. You don’t want to be the guy that is getting ripped on all night because of his hair style. MUCh: What’s a common mistake men make when choosing a hair style? DG: They think they can pick a popular celebrity haircut and mimic it, when realistically their hair will never achieve that look, no matter what you do. Editor’s Note: Deanna also mentioned that guys have brought in pictures of “Ryan Gosling, David Beckham, and Owen Wilson” to show her the style of haircut they want. First — we hope they didn’t bring in a picture of Beckham during his cornrows phase. 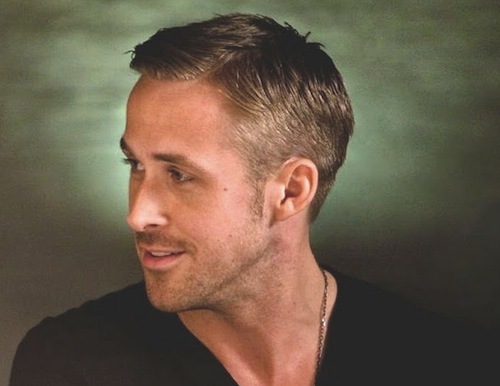 Second, we think Gosling’s no nonsense haircut with a side part seen in “Crazy Stupid Love” is a good style that would work for many guys (see above). That being said, it won’t make you look like Ryan Gosling (see above and then look in a mirror). MUCh: During the past several years lots of men in big cities have grown beards. For those who are keeping their beards, but also getting older and in need of a more refined look, what haircut should they opt for? DG: Clean cut around the neck and ears are a must to avoid looking unkempt. And definitely get beard trims and lined up on the chin. Deanna Goldstein and Van Buren Gentleman’s Salon is located at 235 W. Van Buren St. in the Loop. keep the beard lined up on the chin? Yeah, if i want to be a backstreet boy. I keep mine trimmed one inch above my adams apple. Thank you for including Ryan Gosling in one of your posts, even if it’s an ancillary reference.